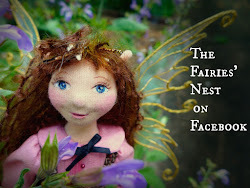 The Fairies Nest - OOAK Cloth Dolls & Fiber Fantasies: New Dolls at last and a bit of a Sale! 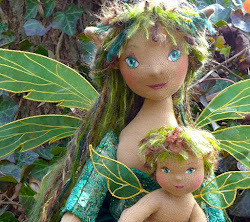 At last... meet Holly my new art doll! 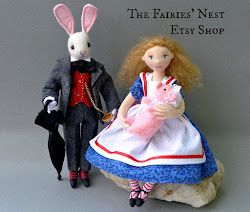 Yes, I have finally finished a new art doll as well as a couple of little holiday dolls. There are two more of the larger dolls on my table almost ready and I'm all caught up on commissions, so I'm feeling pretty productive these days. Of course I'm spending the rest of today and tomorrow getting ready to serve Thanksgiving for 23 people so I imagine that feeling will be very short lived. And in the big news folks it's sale time once more! All items in my Etsy Shop will have free shipping for 4 days; Friday Nov. 27th through Monday Nov. 5th. So come by and take a peek! As I mentioned, Thanksgiving is almost upon us and I am very thankful for all the wonderful folks that I've met through my blog this year, thank you so much for the support and love you've shown myself and my creations. You dolls are so cute. I love the shoes on that fairy. This doll is very, very beautiful congrats!! They are both beautiful but I love the Pixie the best. Beautiful dolls as always. Happy Thanksgiving - 23 people - good grief!!! Hooray! You got a new art doll complete. She's gorgeous.